It’s just one more weekend before Furious 7 blows everything up, but there isn’t much calm before the storm this weekend, as we’ve got a notable comedic pairing and the first pure animated release of 2015 that should keep the box office on a relative winning streak. Get Hard pairs Will Ferrell and Kevin Hart, with Ferrell playing an investment banker being sent to prison (so it’s obviously fictional). He immediately panics and decides to ask seemingly the only black guy he knows (Hart) for advice on how to survive in the joint. The problem being that Hart’s character never went to prison. Racial profiling leads to comedic hijinks! While the film is obviously banking on the high recognition both Ferrell and Hart have, neither is riding much of a hot streak right now. Ferrell has actually kept a fairly low profile lately, with just Anchorman 2 and the main antagonist voice in The LEGO Movie in the last year and a half, while Hart hasn’t come close to matching the success of last year’s Ride Along ($134.9 million), as this January’s The Wedding Ringer ($64.2 million) underwhelmed and has veered Hart dangerously close to the point of overexposure. Get Hard is going for what we in the business like to call “the hard sell,” with a ridiculous amount of ads during the NCAA Tournament and just about everything else on television. Reviews are abysmal and call the pairing wasted on offensive and borderline racist material. Still, both leads still have appeal and are two of the stronger comedic actors working right now. A weekend of $27 million and a quick free fall out of theaters feels about right. 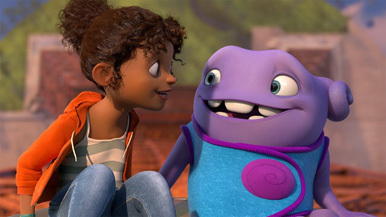 Believe it or not, Home is the first fully animated release of 2015. It’s from DreamWorks and is based on the children’s book The True Meaning of Smekday. A friendly yet bumbling alien named Oh escapes to Earth and befriends a teenage girl who is also trying to run away from home. The search for Oh sends the rest of his race to Earth, which causes problems that are not explained in the trailer but are gleaned when trying to describe the plot of the movie. Voice acting is provided by Jim Parsons, Steve Martin, Rihanna and Jennifer Lopez. So even if the movie isn’t that good, it’ll probably have a booty-shakin’ soundtrack (with possibly a banjo track thrown in as well).